At Disneyland, shooting Sleeping Beauty Castle at night with no one in the frame is a patient affair. One simply waits until the park has officially closed... and then wait an addition half hour to ninety minutes. Eventually the people will filter out, but the time is still required. Over in Disneyland Paris, the process is considerably simpler. The French do not put as much commitment in their work, so when it is closing time, they tend to want you out as quickly as they can get you. 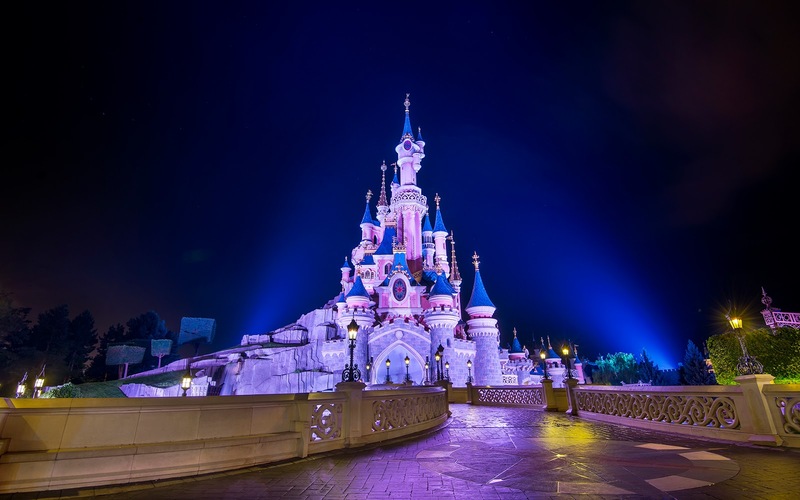 In this case, I was at Disneyland Paris on an evening when Disney Dreams--the park's incredible fireworks and projection mapping and water fountain extravaganza--was playing. Unlike fireworks at all the other parks, which occur at the midpoint of the night, Disney Dreams starts when the park closes. So it becomes the last thing guests really do, and after it concludes, the park has already been closed for nearly half an hour. Thus, with the area in front of the castle already blocked off, I had little trouble taking empty castle photos. But I had to be quick, and I only got several views before security was present to ask me to start heading back out Main Street. Fortunately, I was able to get a "front and center" view. With the post-fireworks spotlights lighting up the park icon, it certainly made for a beautiful sight! Le Château de la Belle au Bois Dormant after the evening's performance of Disney Dreams.